As the Casey Anthony trial continues to progress it amazes me at how captivating it is to the public. Anthropologically humans are an interesting specie. It seems that violence, bloodletting, and death sing to them an inescapable Siren's song. The deeper the depravity, the deeper human interest plunges. In the wild of nature death and decay are the ruthless laws of survival. But, aren't humans assumed to be further along in the developmental process that that? The Casey Anthony trial has, sadly, proven humans to be closer to their Serengeti dwelling neighbors than to some higher order of civility. Don't misunderstand my thought. I'm not agonizing over news coverage of the trial. The tragic lose of a precious, young girl deservers attention. 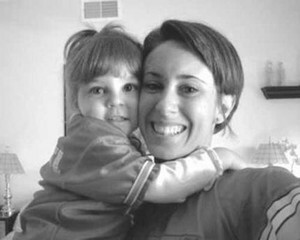 Young Caylee Anthony could have been the poster child for being cute and lovable. I'm not even agonizing over all the media attention per se. Since mid-2008 the Anthony family has been the subject and, often times, the guests of talk shows on all major networks. Casey and her parents, George and Cindy, have been scrutinized intensely by the media over the past three years. All in the pursuit of justice...right? Right? If you take time to reall dig into the life and ministry of Christ you'll see an incredible diversity of ministry methods and opportunities. He spoke in large, prestigious synagogues and he preached to crowds on hillsides in the middle of nowhere. He ate in the homes of the rich and famous as well as on the beach by a campfire. Jesus had nothing, yet He had everything. Jesus met the needs of people where they existed. Diversity was the defining theme of Christ''s approach to touching hearts, replacing loneliness and despair with hope and purpose. Christ did it all and diversity was a common thread. The word diversity also defines another great ministry. It defines the Clergy And Police Alliance of the Fort Worth Police Department. The Clergy And Police Alliance, or CAPA, is an alliance of local pastors with the Fort Worth Police Department and have as its goal helping to inject calm into chaotic circumstances. CAPA performs a ministry under the guidance of the Fort Worth Police Department that is itself widely diverse in its scope and reach. Further, I am honored to have been accepted into CAPA and recently graduated the training program to become one of its newest members. The concept of CAPA is really very simple. Since a CAPA member isn't an employee of the city of Fort Worth they can do and say things an officer can't. It isn't the job of CAPA to interrogate victims or perpetrators, or in any way act as a sworn officer. CAPA members are not trained law enforcement. They are, however, trained instruments of help and healing. CAPA members answer the call no matter the time of night or day to bring the calm of God's presence permeate those who are facing the hard realities of life. CAPA members also count building lasting relationships with officers themselves. To do this CAPA members are encouraged to spend as much time riding in patrol cars and being out on the street with officers as much as possible. Here's a great video about Costa Rica. It came to me from Nidia. It's very nostalgic for me as I have been to many of the places featured in the video. Watch it and you'll quickly see why I am so proud of being an adopted Tico. I wonder, over the generations, who may have stood on this balcony. Lucy, you got some "splainin" to do! The 50's sitcom I Love Lucy was all about the Ricardos, Rick and Lucy. When one of Lucy's schemes would backfire Ricky, in his heavy Cuban accent, would shake his finger at Lucy and say, "Lucy, you got some 'splainin' to do!" This web site isn't a scheme but I do want to take a minute to "splain", or rather, explain what it's about. I have hosted a blog site for some time now. Muscular Madness was born out of my desire to give my creative mind an outlet wrapped around my interests and hobbys. Muscular Madness, as its name suggests, focused primarily on physical fitness and body building and had much of the same content as this site, but on a much different format. In many ways it was a direct reflection of my life as it was at that time. But, times change and so do our lives. Mine changed in a big way a little more than a year ago. A little more than a year ago my Mom died. It's still difficult to even write the words but that is the inescapable reality that stares me in the face as a hallow, expressionless figure. February 13, 2010 was the day that changed my life. Despite that loss life continues and there are a myriad of things to live and be thankful for. However, I cannot deny that my focus has shifted and there has been a paradigm shift for me that has rattled me to the core. This site, I Am Screaming, reflects that paradigm shift. I wanted a domain name that reflected how I felt and what I wanted to say. The emotions and sense of loss since Mom died has, at times, been overwhelming. One of the things I needed to do was give an outlet to my grief and emotions. Thus, you have what's before you. The difference between this site and Muscular Madness is that the focus has shifted from the external to the internal. The areas that will receive most of my attention are Mom, Panic & Anxiety, and Thoughts. I Am Screaming will reflect a much deeper, more personal introspective revelation of who I am and what makes me what I am. Please browse around. Leave comments, but mostly I want you to know that no matter what the storm is you may be facing at this moment there is hope and there are brighter days ahead. Today is Mother's Day. That's good and that's bad. The good is that all across the country millions of moms of all races, cultures, and religious beliefs are being taken to Lubys, given flowers, and told by smartly dressed children how appreciated they are. Or, at least I hope so. Because the bad is that I can't do any of that. Today should be a difficult day, but truthfully it's no different than yesterday or the day before. When the hole in your soul is big enough to contain every star in the galaxy what's a day make? Life's experiences make us all wiser and more appreciative of the things life offers us. Tragically, at the time those things seem small and of little value. It's only after they are gone do we fully know their worth. As I have gone through boxes of Mother's papers and mementos I have gained a much clearer insight into who she was. Not that I didn't know her before, but the window into her was polished and focused with more clarity. I was the apple of her eye and going through her things made me know that even more than I did. Only now have I fully realized the value, the irreplaceable worth she had. Today is Mother's Day. It's the first of many that I will celebrate without having the one to celebrate with. As painful as that may be, it doesn't make me unique. It only makes me older, wiser. Age passes at a frantic pace, time passes even quicker. The fleeting ticks of the clock ore gathered by Old Man Time and formed into days, which, in turn, serve as the bricks of time that form weeks and years. The present now presents an opportunity to savor the little things that remain. Only now perhaps I'll esteem them with the value they deserve and the attention they demand. Through this I have gained a new found admiration for those who have preceded me in loosing a parent. It isn't easy even if it's all part of the natural ebb and flow if life. Today is Mother's Day. I'll celebrate it by knowing Mom's always at the center of my heart. I will always recall the time her and John came to spend a few days with Nidia and me. As they were leaving we all stood outside the front door giving our goodbye hugs. As I hugged Mother I remember how small and fragile she felt in my arms. But, in that fragility was a woman I know to be tough as nails and strong willed. Even as her health began to fail her she never lost that spirit of fight and ruggedness. It was those qualities she imparted to me and used herself to protect me. She was and will always be my hero. This video is restricted viewing on YouTube, although it can be freely viewed here. If you need to view it directly from YouTube contact me and I can email you the URL. This is the video tribute that was used at her funeral. I want to thank Bert Gritz of Cordry-Gritz Funeral Home for providing the copy. An acorn is food to some while to others a dream. A squirrel scurries across the meadow that glistens and ripples in the warm sunlight; a meadow bristling with life. The meadow is circled by towering oak trees, massive towers of timeless strength and endurance that rise above the mist. The squirrel is busy gathering food in the warmth before the cold winter sets in and snatches all the tiny acorns he can find. Returning to his borough, in his haste a stray acorn falls to the ground. A tiny acorn once destined to feed a family of squirrels has now become a dream, a dream of the forest. Through the cycle of seasons, time after time this same process creates new forest and new life. In Dante’s Inferno there is another “acorn” that falls to the ground. There is another source of change, of dreams becoming reality. In allegory, the squirrel represents Dante, the meadow represents Hades, and the acorns represent truth. So that before the cold winter of death claims Dante, by entering the Inferno he hopes to gather all the “acorns” of truth he can that will give him fuller meaning to this present life. 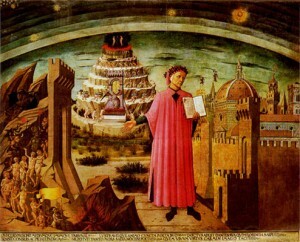 These acorns fall into the soil of his being giving birth to new life and wisdom for Dante. Through his journeys chronicled in the Inferno Dante is able to gather truth, insight, and a clearer perception of justice. Dante grows as the mighty oaks that have their beginnings in a tiny acorn. However, just as in the forest, growth is not always easy or is the way of growth always marked with clarity.